Ponder the words for a moment. Feel the faint breath of high adventure. Imagine a cold and black ocean, covered by a heaving mass of floating ice. Except for a few roaming polar bears the only life is cruising hushed below, shadows of nuclear submarines and Arctic whales passing like strangers in the deep. The ghostly landscape is quiet, mostly covered by a deep fog, revealing its frozen sculptures a few at a time. Only when the moon is full, and the gravitational pull of the moon and sun are combined, the silence is broken: with the sound of freight trains the ice, up to 15 feet thick, is crushed and thrown like casino chips by the high tides. Before you, a frozen war zone of impossible rubble to pass. Now turn to the South Pole. A solid white slab of ice covering the beginning of our planet; the core of Gondwanaland, child of Pangaea. 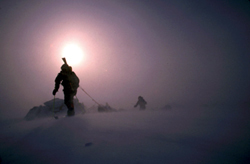 Here frightful Katabatic winds rush down buried mountains at speeds up to 150 mph beneath a sky of seven suns. 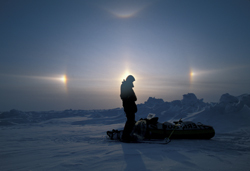 In the center of this mighty continent: the remarkable South Pole station, searching for the spark that ignited it all. Imagine yourself in the midst of those unforgiving places, just you, far from any civilized life. What would it be like, and what would you be like in it? Would you survive? Would you cope? Would it change your life? In this age of the third Millennium of human chronology there seems not much left for young explorers to discover on Earth. TV shows fly around the world in ultimate adventure races. Anyone can buy a rafting trip through the Amazon. We've been to the moon; in fact we are so bored with exploration we don't even bother to go to Mars. We know already what to expect there anyway. Been there, done that! Or have we. There is a huge difference between looking at a picture of a planet and actually stepping down on Mars red dirt. A competition in Iceland surrounded by film crews, medical staff and tour organizers doesn't compare even close to the experience of standing all alone on a mighty sheet of Arctic ice. The difference lies in the silence. Only in this silence can you perceive the call of adventure reaching for your spirit. This is the cry of man braving nature, or rather - the whisper of God exposing man to himself. There are many places left on Earth to be discovered. Not by mankind perhaps, but by you. Yes it is possible to fly to the poles or to be virtually carried to the top of Mount Everest. But go on your own out into the wild, and you'll be in a very small number of living explorers that share your experience. Bring a close friend or two, why not, but go for the real thing. Today's high end adventure is less about the destination and more about the road. The expedition to discover the true you. If you are one of the few seriously pondering the dream, ready to embark on your own journey across the polar caps, you are up for a ride of your life. Guaranteed. You are entering the footsteps of Cook, Peary, Shackleton, Scott and Amundsen, and for you we have created this guide.